If you are interested in English history then Wigmore is a real treat. Wigmore was one the most important of the castles founded along the Welsh Marches after the Norman Conquest. It retained its military significance until the English Civil War. The Castle is now a glorious ruin, but in medieval England was the seat of power of the influential Mortimers; Roger Mortimer made Wigmore his base and held many banquets and tournaments within its castle walls. 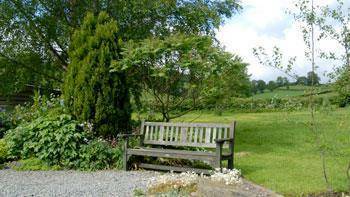 It’s a short walk and climb from Pear Tree Farm and there are stunning views from the keep. On the way up visit Wigmore’s very impressive church – St James. Parts date from 960 and you can see Saxon herringbone stonework on the interior and exterior walls. Wigmore is mentioned in the Anglo Saxon Chronicles and in the Domesday Book. The Castle was destroyed in the Civil War (1642 – 1651) by parliamentarian Lady Brilliana Harley who owned it at that time. The Harley Family still occupy the estate at Brampton Bryan, which is hidden behind a wonderful old cloud clipped yew hedge. You may not know that London’s Wigmore, Harley and Mortimer Streets are all named after this village and the great families associated with it. There are two pubs in Wigmore, a short walk from the house. The Castle Inn has a smart restaurant serving very good value food and has specials on some nights. The Oak has just opened after a very major refurb. and is just serving drinks at the moment – but its restaurant will be opening shortly. 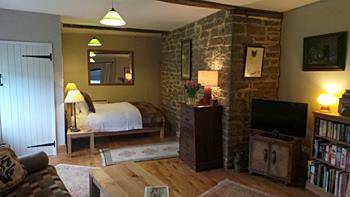 The Apartment at Pear Tree Farm is a large bedsitting room with kitchen, its own stable door leading to the garden and a small but perfectly formed shower room. It has double bed and futon sofa bed and is suitable as a double or a twin room. Fresh coffee and a variety of teas are complimentary and we will be delighted to supply a selection of local food for your breakfast and/or dinner – to order - click on 'Food Selections' link for details. We are retaining our residential license so we can provide you with local beers, cider and a small selection of Tanners wines too! We provide lovely quality linen, towels, bathrobes and L’Occitane toiletries. The Apartment is perfect for exploring historic Wigmore – its Saxon/Norman church and ancient castle – and is in wonderful walking and cycling country. AND – we now have two newly refurbed pubs in the village serving local ales and restaurant food. Whether you like visiting stately homes and gardens, walking, cycling or just chilling out, there is something for everyone here. We've got lots of brochures, guide books and maps for you to look through. 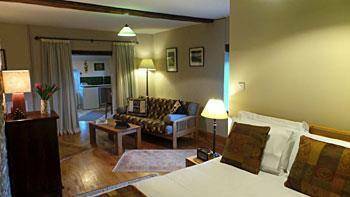 You won’t find us on any booking websites – so please phone or email for availability. 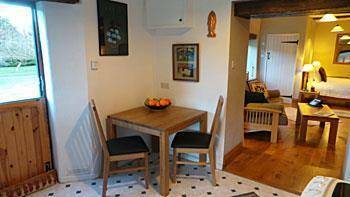 The Apartment is perfect for two people sharing and is available all year round.